Background: Early-stage esophageal cancer can be cured by surgical resection with low mortality and excellent five-year survival. Recently, however, endoscopic therapies have been proposed as an acceptable alternative. Endoscopic ultrasound (EUS) is typically used for pretreatment staging; the presence of muscularis propria invasion and/or nodal metastasis are a contraindication to endoscopic therapy. We hypothesized that preoperative EUS may lack sufficient accuracy to identify appropriate candidates for endoscopic therapies. Methods: Patients with early (clinical stage 0 (high-grade dysplasia/tumor-in-situ (HGD/TIS)/N0) or stage 1 (mucosa/submucosa (T1)N0)) esophageal adenocarcinoma who had undergone esophagectomy were identified from an IRB-approved prospective database. Patient demographics, preoperative staging (EUS, computed tomography (CT), positron emission test (PET)), and pathologic findings were collected. Preoperative clinical and final pathologic stages were compared. Results: Between 2000 and 2007, 38 patients underwent esophagectomy for clinical Stage 0 or 1 disease . EUS was performed in 34 (90%) and CT in 33 (89%) patients (Table 1). Preoperative clinical staging was incorrect in 13 (34%) patients. Accuracy of EUS for prediction of tumor (T)-stage was 71% and 91% for nodal (N)-stage. Three patients (9%) were found to have invasion of muscularis propria (T2) and 3 (9%) were found to have N1 metastases on final pathology. 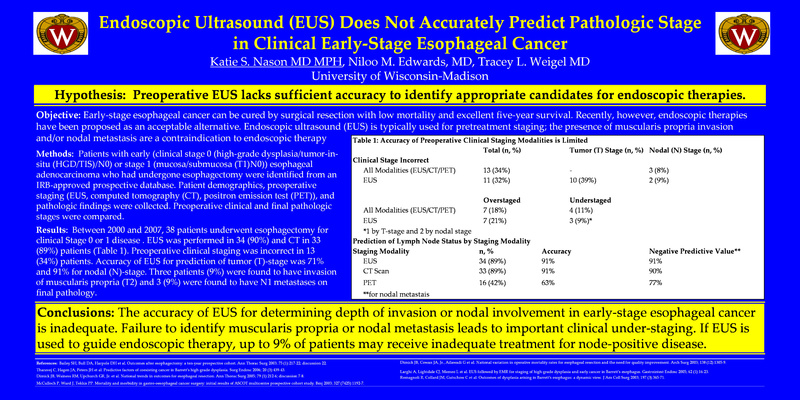 Conclusion: The accuracy of EUS for determining depth of invasion or nodal involvement in early-stage esophageal cancer is inadequate. Failure to identify muscularis propria or nodal metastasis leads to important clinical under-staging. If EUS is used to guide endoscopic therapy, up to 9% of patients may receive inadequate treatment.